Piper is adorable and Barrack is a pretty handsome fellow, as well! Happy New Year! What a great photo. He looks a grand rooster. Hi Janine, I've found you!! Thanks for visiting my blog, as soon as I saw your comment I jumped on and found your new blog and read all your adventures since you left Perth. I'm soo pleased you found somewhere special that you are happy. Thank you so much for your comments. Piper is a lovely young lady and she cross stitches which is a bonus. 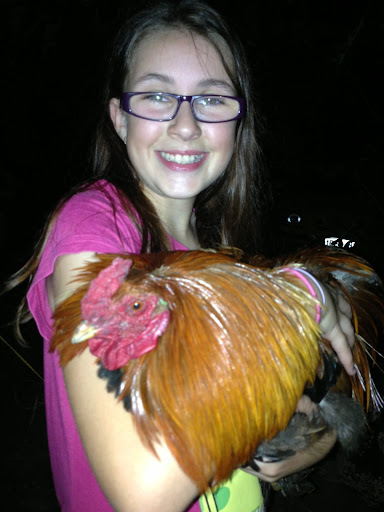 Nicola Barrack is a grand rooster and I was so lucky to be gifted him from a chicken breeder. Julie my family time was fantastic and Lisa I should have commented on your blog ages ago as I have been following you for quite a long time. Yes we are very happy down here.